The Christmas Letter: How to Create a FANTASTIC Letter Your Family & Friends Will Ask You to Send! Create THE Christmas Letter Your Family and Friends Want to Read EVERY Year! Some people go Griswold with their holiday light displays. But, I like to do something similar with my annual Christmas newsletter. Here are 7 tips for writing your own custom Christmas letter--one your family and friends will request every yea. 7 Tips for Creating Your Own Custom Christmas Letter— One Everyone Wants to Read! #1 Gather information the ENTIRE year. Here’s what I mean here… don’t start writing your letter on December 1st, because you’ll end up having to rack your brain all day trying to remember what you did all year. My suggestion is to organize your digital pictures by month--and this is presuming you’ll create your Christmas newsletter on your computer. Each month download pictures from your phone and put them into their own monthly folder. For example, I label all my photo folders something like this: YEAR_MONTH. So, 2017_FEBRUARY. Then in February’s folder I can create a separate folder for individual events that happened that month. For example, if I attended a wedding or went out of town, I would probably create a separate folder inside that February folder to house all those pictures. 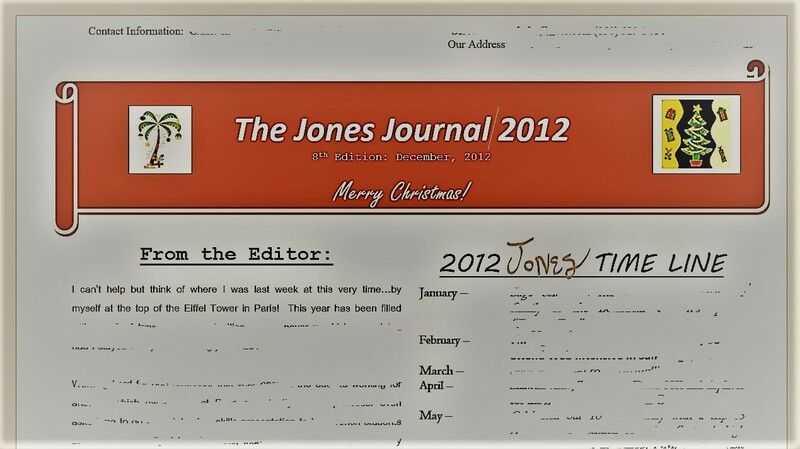 That keeps everything neat, together, and organized when I go to create my Christmas newsletter. You can also create a timeline. This is an overview (very short) of what happened each month. For example, in January after I've sent my Christmas newsletter for the previous year, I open that file and erase all the old stuff, and then save it as a new file. Then every so many months, I write what events or things happened that month in the timeline section. There are a few ways to create a timeline. One of the most common ways I’ve used it are to go month by month or quarter by quarter. For example, January is the birthday month for my poodle. So, her birthday celebration (whatever it was) is noted in the timeline as “Sage celebrates BLANK years old with a trip to PetSmart.” That’s all I do. But, I do it periodically throughout the year. That way it’s not so much to remember 10 months later. Tone is all about the mood you want to set. It shows part of your personality and gives people an inside view into your mind and thinking process. So, if you're a funny jokester, you can make your Christmas letter about fun and merriment. If you’re very religious, then perhaps your newsletter will incorporate the deity you worship. A Christmas letter is meant to share the news of your family and your life in a once a year format. Whatever your tone, be conscientious of your word choice. Be respectful and tasteful with your humor and avoid being too pushy with your beliefs--religious or otherwise (i.e. ideals or politics). Think of your letter as being a gift and a way to bring joy to your family and friends home each year while simultaneously sharing what happened in yours. But, keep the following in mind: avoid being boastful about your “best” stuff that happened (like some folks do on Facebook). Or, complaining about all your problems. Instead, write sincerely. For example, when my little poodle Curly reached old age and began the dying process, I wrote a thank you and farewell note in her column, which caused my phone to ring several times the week after the letter mailed. When something great happens, share it. But, also share how grateful you are for the people that helped you and your family. TMI (too much information) … is TMI--even for a Christmas letter sent only to close family. Spare your family and friends the details of your colonoscopy, laser hair removal, or three-week flu with explosive diarrhea. That doesn’t mean you shouldn’t share that you experienced something uncomfortable, unpleasant, or difficult … just do so using more proper--etiquette friendly--language. Think of your Christmas letter as an annual family publication. All newspaper publications have something fun and extra besides the news. There’s the crossword puzzle, the comics, the anniversaries/births/weddings announcements, the classified ads, the coupons and store ads, sports scores and information, et cetera. Crossword puzzle--I use Discovery Education to create mine. Word searches--I use Discovery Education to create mine. Cryptograms (with a special secret message)--I use Discovery Education to create mine. There are a few ways to organize your letter. If you’re the only member of your household, then your letter will look different than a letter created for a family of 12. Here are some possible formats depending on your family size. They include a list of elements or sections to include in your Christmas letter, but you don’t have to put your letter together in this order or with these specific sections. Format A has some extra suggestions, because it is for a single person and a pet. So, you may want to add some of those elements if your family falls under Format B or C.
Create a “What I Learned” column or something similar, such as Dear Abby (but use your name in place of Abby’s), frequently asked questions, or a hobby column--this is where you talk about your scrap booking success or gardening tips or travel experiences or outdoor journeys …or whatever it is that you do in your free time. Create a timeline of events from your life (and your pet’s) during the year (see #1 above). Create a few fun elements (see those in #5 above). Create a timeline of events from your life during the year (see those in #1 above). Create a few fun elements (see #5 above). #7 Best Computer Software to Use: The One You Know Well! Nowadays, Christmas letters are usually created on a computer. My suggestion is to always use the word processing software that is easiest for you to use. I’ve used Microsoft Office Word to create my Christmas letters for the last ten years. But, the first program I used was Word Perfect (remember that?). In recent years, I’ve thought about using Microsoft Publisher. However, when I went in to create a letter to practice, I realized there was a bit of a learning curve. And, I didn't have that much time to learn it at that particular moment. Plus, I use text boxes in MS Word, because it is easier for me to move text and pictures around. Since I already had my letter set up in MS Word, all I have to do is change some things to personalize the letter for the current year. Because of all those reasons, I decided to stick with MS Word instead of using MS Publisher. So, I always suggest using the software you feel most comfortable with when creating your Christmas letter. 1. How long should your Christmas letter be? My first couple of Christmas letters were only two pages (or one front and back). I do like to keep them short, but now I include fun things—like a word search, a "Blast from the Past" (old pictures section), and a memorial section. Typically, my Christmas letters run about four pages (two pages front and back). The maximum is 6 pages (three pages front and back). 2. When should I start putting it together? I start adding to the time line section as soon as I think of it or have something to put on it—but always before March. Usually, after I finish with the current year’s Christmas letter, I save the file again with the next years date. Then I erase all that stuff and add new starting with the timeline (read #1 above about the timeline). In early November, I start putting together the fun elements--like creating a new word search, adding pictures, creating the memorial section, and other games and details. Then I actually write the news for each family member (my dog, husband, and me) during the first and second week of December. Once everyone approves of their letter (i.e. my dog and husband), then I start finalizing the pictures, and move to the editing process. Editing can take a week--I read it over and work for an hour or two one day, then take a day or two break and read it over again. I repeat the process throughout a week until I get it the way I like it. 3. When do you start writing yours? I start putting it together in January, via the timeline section (see #1 above). I don’t start writing the actual columns until after Thanksgiving/first week of December. 4. How long does it take to write a Christmas letter? It takes a little bit of time (30 minutes to an hour here and there) throughout the year to organize pictures and to create/add to the timeline (see #1 above). But, when I just wrote a simple two-page (front and back) letter, it took only about a week or two to write (a few hours of writing and a few hours of proof-reading/editing and placing a few small pictures). So, depending on how much you want to include--i.e. how many fun elements and pictures you add, and how many people are in your family (the columns)--will determine how long it takes you--that and if you enjoy writing and it's easy for you. 5. Who do you send them to? Everyone? I send mine to close friends and family only. I also have a rule: if I don’t hear from you all year or ever, you don’t get one. This is because I am putting my family’s lives on paper … and I’m not going to waste a stamp talking to someone on paper who doesn’t really care or have time for me/us. I send my letter to no more than about 20-30 people, depending on the year. The majority of those people are relatives who live in other parts of the U.S. or abroad. 6. Who do you NOT send Christmas letters to? 7. How do you mail them, i.e. envelope or fold over and staple? My letters are always mailed in an envelope, as to ensure they don’t get stuck in some post office machine … it’s happened before. 8. Do you print them yourself or go to a printing store, like Kinkos or Office Max? I print them myself, but it’s because I have a very nice printer and cheap ink. I also only use 8.5 x 11 size paper. I have a friend that used an 11x14 inch paper to create her newsletter, and they took them to a printing store--and printed them in black and white (much cheaper that way). 9. How do you prepare for the next Christmas letter? I prepare by putting my digital pictures in computer file folders each month. (So, yes, I download my photos each month--and sometimes I download them immediately after an event of some sort where I took several pictures.) I also add to the timeline section of the letter each month or every so many months, so I don't forget what our family did. 10. Is there a specific date you should send it by? I like to send the Christmas letter so folks receive it right before or right after Christmas. After is good, because there’s a little down time before New Year’s, and it gives folks something to read and do (the fun elements, see #5 above). Where as before, there is SO much to do. But honestly, it depends on what’s going on in my life. One year I didn’t send it until January, because I was out of the country. 11. Do you print them in black and white or color? I’ve done both. Black and white when my printer wasn’t as good and it was cheaper to do so. Currently, I print it in color. I also do not send more than 30 letters, so it’s okay for me to print that many in color at home. 12. Do you use special envelopes and postage? Yes, I do like to use special envelopes. Right now though, I have an over abundance of a particular white envelope … so as a fiscally conservative minimalist, that is what I’m using. If I can get Christmas stamps, I do. It adds a nice touch to the envelope. Sometimes I put a Christmas sticker to seal the envelop on the back. And, some years I’ve put a small Christmas ink-stamp mark or sticker on the front for decoration. 13. Have you ever skipped a year and not sent one after sending Christmas letters for years prior? I really enjoy creating the letters, so I have never skipped a year since I started writing and sending them. Some are sent later than others, but I always send one. However, I have skipped sending them to people, because I haven’t heard from them or their letter was returned to me by the post office. Sometimes, I hear from them … when they complain that they didn’t receive one. But I've always sent a Christmas letter. 14. What happens to letters that are returned? If I have the person’s phone number, I may call. Usually when this happens, I don’t have a phone number for him or her or the one I have ends up not working. So, I just don’t send a letter to that person the next year. And, I shred the returned letter. 15. Do you schedule a day in November to write the Christmas letter and put it all together or do you write/create it a little at a time throughout the year? I put my letter together throughout the year to cut down on the time spent during November and December. More importantly, I do it throughout the year to help me remember all the little details about what we did each month. It also keeps my excitement and momentum going to create a Christmas letter that is even better and more fun than the last. Want to Share Your Christmas Letter or Christmas Letter Ideas? Have a unique Christmas letter or Christmas letter idea? Share it! Do you have a picture of your Christmas letter or a picture of your Christmas letter idea? Super! Click the button and find the first one on your computer. Select it and click on the button to choose it.